The elementary years are a time for growing, changing, and learning. Our goal is to provide a setting where every student can learn, and each person is respected, valued, and challenged. We celebrate diversity and the uniqueness of each individual. Working together, students, teachers, and parents make the school an exemplary environment for learning. The elementary language arts curriculum embraces a balanced literacy approach to reading and writing instruction. The reading program emphasizes phonemic awareness and incorporates grammar and writing skills. This curriculum balances skills with quality literature and strongly connects the reading and writing program to develop proficiency in both areas. In grades three through six, novel units enhance themes taught in the other disciplines and develop an appreciation for various genres of literature. 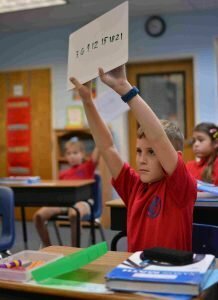 The Shurley Grammar program in conjunction with spelling and vocabulary study, round out the language arts curriculum. Our goal is to instill a love of reading and writing in each child and to encourage students to become lifelong learners. The mathematics curriculum is designed to provide a foundational knowledge of mathematical skills crucial to problem solving in real world situations. Varieties of instructional methods are used including math manipulatives, hands-on activities, group projects, centers, and drills to facilitate mathematical understanding. The primary focus is to teach number recognition, patterns, computation, reasoning, problem solving skills, and algebra. The students are encouraged to apply these skills in many different ways. Each student is taught to have a mathematical cognitive structure that builds upon prior learning and fosters a solid foundation for future math instruction. The social studies curriculum seeks to prepare the students for the complex world in which they live. The curriculum provides opportunities for discussion about the world and its history. From the study of our local history to the study of ancient cultures, Grace elementary students are exposed to the economics, politics and sociology that brought us to our modern day. The science curriculum at Grace connects scientific principles to everyday life and encourages our students to draw inferences about the world around them. Students are encouraged to use the scientific method to test these inferences. The curriculum is hands-on, age appropriate, and easily integrated into all subject matters. Field trips, science projects, and experiments enrich the science program. Christian formation and character education are the very heart of our school. Christian formation classes are provided at every grade level and are designed to teach students about Christianity and grow in their relationship with Christ. Students of all faiths are invited to participate. The art program continues to build on the foundation laid in preschool while revisiting some media in a more sophisticated way. Children learn to love art while experiencing a wide range of media and activities. These may include: drawing, painting, carving, acrylics, tempuras, watercolors, printmaking, weaving, and ceramics. Art history and appreciation, color and design principles, and drawing and painting techniques are also built into the lessons. This program is designed to foster creativity, develop skills appropriate to age levels, create an appreciation for great artists and their works while developing a useful vocabulary. Each class has physical education twice a week. 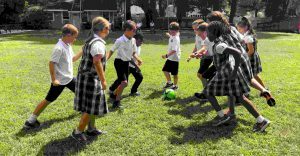 Lessons are designed to teach students the fundamentals of different sports, with an emphasis on promoting physical health and good sportsmanship. 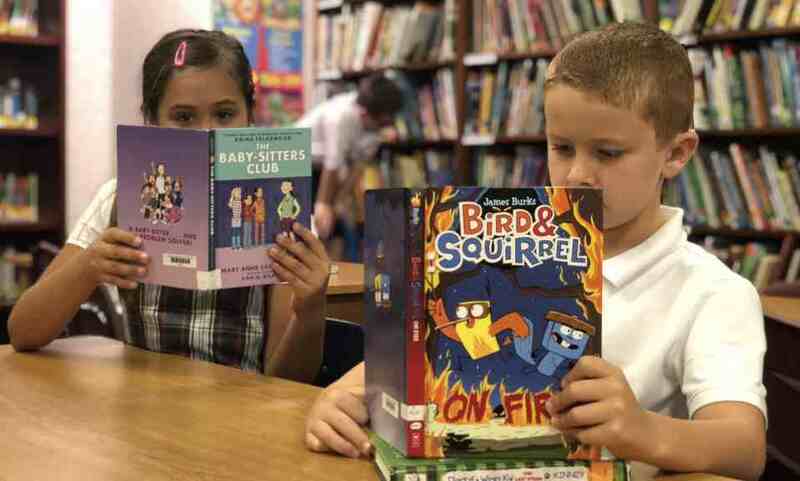 Library time provides students with the opportunity to check out books, learn about the layout of the library, and take Accelerated Reader Tests. For the upper elementary grades, research skills and proper digital citizenship are introduced. Basic concepts and vocabulary are introduced to the students. They will learn simple sentences, greetings, questions and answers, and participate in activities that will allow them to practice their Spanish skills. The teacher also uses traditional Hispanic songs, games, and stories to incorporate the Spanish culture. Spanish instruction focuses on grammar, reading and writing, vocabulary, and conversation. Musical instruction is taught weekly. Students study musical notation, recognizing the direction of melodic lines, major and minor sounds, musical forms, styles, and structure, and how these ideas relate to music today. They learn to play, compose, and perform music using their voices and various instruments including drums, ukuleles, and Orff instruments. Units on important composers and musical styles from around the world are also part of the music curriculum. Students are given numerous opportunities to use their musical abilities. Programs are scheduled throughout the school year that showcase the student’s vocal and instrumental talents. 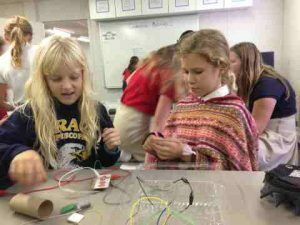 The technology and STEM program in the elementary division is constantly evolving. This program is designed to help prepare our students for the future. The use of technology at Grace enriches and expands the learning opportunities for all students, allows for differentiated learning, project-based learning, and promotes creativity, problem-solving, and collaboration.